Nixon Motor Sports: What To Watch TONIGHT: The Tesla 3! The Tesla electric cars have been growing in popularity, despite their high price. By high price I mean north of $50,000. Uh, north of $85,000 actually. Well, the wait for a cheaper Tesla ends TONIGHT, when Tesla unveils/delivers the first Tesla 3 live on line. The 3 has a range of over 200 miles on a charge, and starts at just a hair above the average selling price of new vehicles in the US, at $35,000. 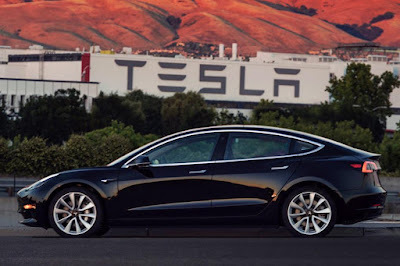 The Tesla video states that 35K is before any tax credits, so depending on where you live and what the current laws are, you might end up paying less. Now for the bad news. From what I've read, there are something like 400,000 people ahead of me in line to buy one. Production is predicted to be up to 20,000 cars per month, so by doing some math with those two numbers, it looks like if you want one you're going to wait something like 20 months for one. Maybe a few of those 400,000 folks won't actually get one, so let's just say you'll be waiting a bit for a Tesla 3. So far there are two countries that have decided to phase out gas engines by 2040, and the popularity and technology of electric cars continues to increase. The NMS team have test driven some electric cars like the BMW i3, and we're willing to test drive a Tesla if you want to pull one up to the garage!